Household waste disposal sites are more commonly called Recycling Centres here in the UK, and putting it out onto the street for collection is definitely discouraged. Marion would find herself reported and fined after leaving such a large amount of household waste in the street if she lived near me! 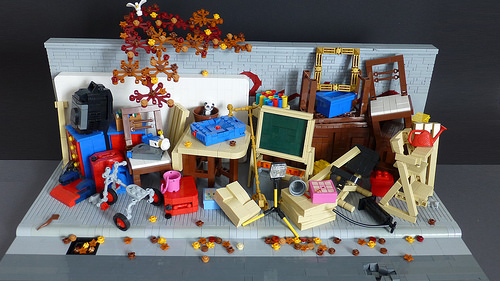 Thankfully in the LEGO world, everything is awesome, and that includes household waste left outside on an autumnal day. There are so many objects in here to love: the blackboard, old mattress, children’s chests of drawers, adjustable spotlight, folding table… Even the cardboard boxes are cleverly built with ‘interlocking flaps’. It’s a melancholic scene in some ways as it looks like there’s been some growing-up in this household with old toys, a tricycle, high chair, booster seat and bike pump lying amongst the other discarded items. 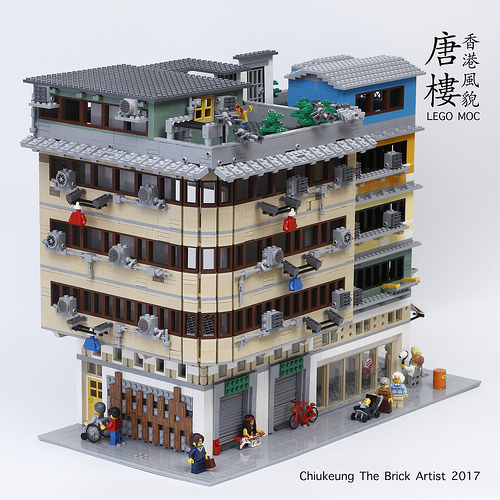 Walking amongst the old residential buildings in certain parts of Hong Kong, one looks up to see hanging laundry, treasured rooftop garden space, and air-conditioning units attached to dusty windows. 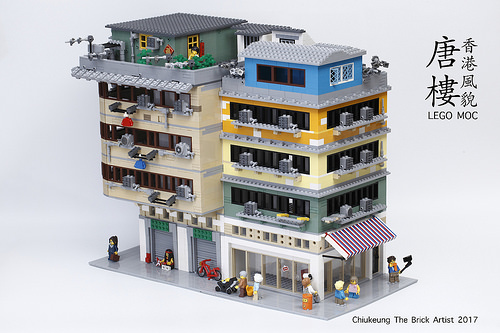 Chiukeung Tsang has captured the scene perfectly in LEGO, with loads of character packed into one model. The curved corner is typical of the architectural style, as are the rows of windows, and the commercial nature of the ground floor with residential housing above. I particularly like the use of colour on the right, it lifts the entire build and adds visual interest without looking too garish. The view from the other side shows the typical ground floor shop, complete with awning, and the obligatory tourist posing for a selfie.